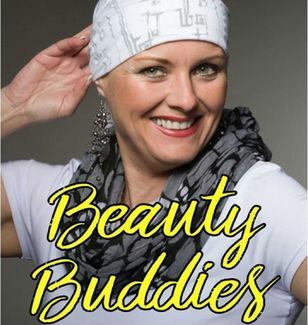 New from Chemo Buddies... it's Beauty Buddies! Welcome to chemo! That just doesn't right, does it? We're so sorry that you are here. But here's the good news, we're here with you, walking beside you and ready to help. We've learned that some of the cosmetic side-effects of chemo can be just as hard on a woman as the physical ones. Losing your hair is never a fun experience, and your skin gets so dry! But don't worry about a thing, we've got you! We are ready to share with you everything we know including how to accent your features, draw eyebrows, how to care for wigs and answer any other cosmetic questions you may have. We have custom made this class just for you, our buddy in treatment, because we want to make this part of your journey less stressful. Don't want to come alone? Yeah, we get that. If it makes you feel better, you can bring your best Gal Pal and come together. Classes are ongoing and will be the first Monday of the month from 10 am to noon, and the third Thursday of the month from 6 -8 pm. Class is free, but you must register to attend, and your gal pal should also register. If you want to register your gal-pal that's okay too, but please give us her name and email address as well. You must be a current chemo patient to attend. Please let us know how long you've been in chemo.